"Very professional from start to finish. When I first met with Mark he took time to evaluate and explain what needed to be done to our home. His estimate was detailed, clear and he took time to make sure we understood all that was needed. He had three crews doing their portion from replacing soffits, complete tear off of the old roof and adding the new to replacing all the gutters. The workers showed up on time, were extremely courteous and took their time to make sure we were happy with the work being done. Our house is surrounded by landscaping which they were very careful with and after it was completed they did an excellent job cleaning up the yard. The next day I had a visit from their service manager and owner Mark who inspected the job. They got back up on the roof and examined the work closely and checked in with us to see if we had questions, concerns and see if we were completely satisfied. Overall we are pleased with the work and have already recommended them to others." 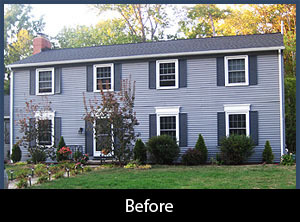 - Karen P.
"I had a complete roof tear-off, re-shigle, ventilation and gutters installed. The work was done quickly and professionally and the communication was great. I always knew what to expect." - Susan S.
"The salesman was excellent and knowledgable. The roofing crew were nice and did an excellent job cleaning up after the job was done. My new roof looks great!!! They even came out and fixed the area that was leaking for free until the full crew could get to my house. 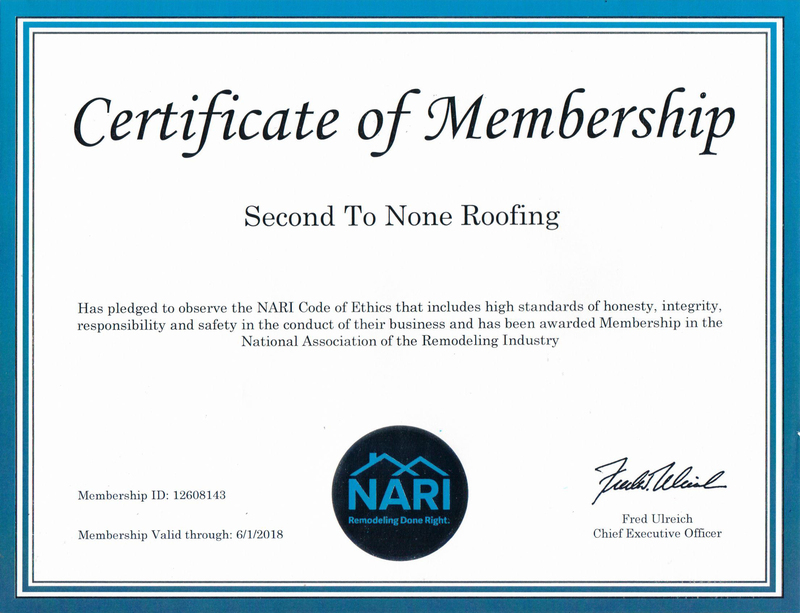 I would recommend them to family, friends or anyone needing a new roof. I had four other companies come out to give me an estimate on repairing my roof. I felt the best about Second To None and chose them." - Terrance H.
"We wanted to write to tell you about the excellent job your crews didi on our storm damaged roof. At all phases of the job, your company was helpful. 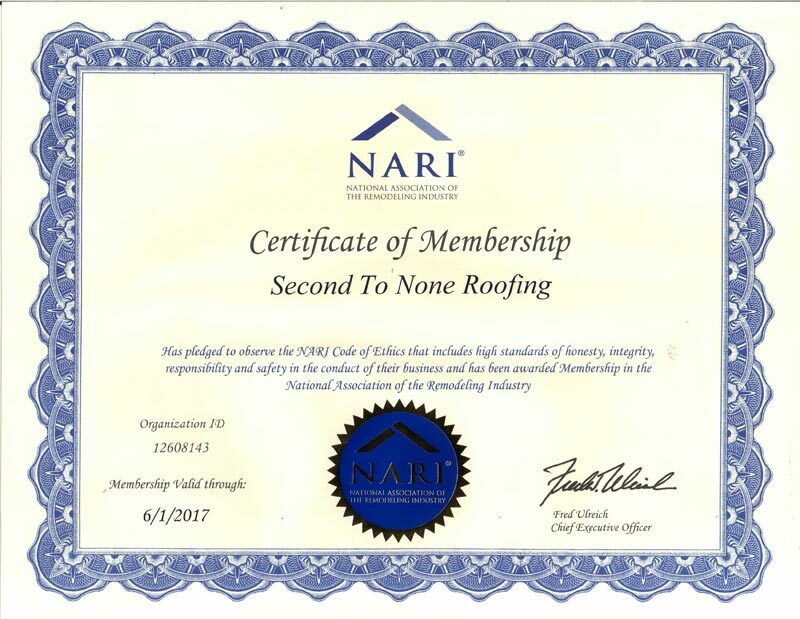 From the estimate, to picking out the roof color and style, to the installation of the roof and finally to the repair of the siding, your crews represented your company with professionalism and integrity. We were impressed with both the sales and installation crews. They were as polite as they were diligent in completing their work. Having observed crews from other companies, it was evident that yours is head and shoulders above the rest in both professionalism and job performance. We would not hesitate to use your company again. The roof is an amazing improvement to our property. Please know that we have recommended your company to anyone who has asked; and we will continue to do so. We've had people stop us to comment on how nice the roof looks; and we've seen others writing down your phone number from your sign in our yard. What a wonderful endorsement of a job well done!" - With our thanks, Paul & Kim O. 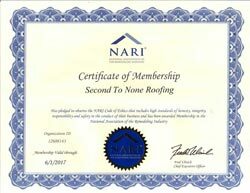 "I can never praise Second to None Roofing enough for the roofing that was completed, the follow ups, the immediate assistance provided. I would and have recommended you to others. 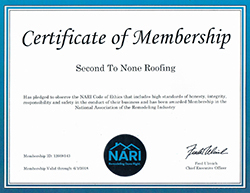 Second to None Roofing represents everything you look for in a contractor." – Ed S.
"Thanks for the speedy job. Your service people were great!" – Don R.
"Thank you for our beautiful roof and gutters. We appreciate that your company did everything to make sure we were happy with the results. Thanks again." – John and Deb S.
"The roof looks great and your workers were very nice!" – Judi S.
"Great customer service. Roof looks great! We are already recommending you to others." – Jamie C.
"Thank you once again for your excellent service and your always being so pleasant when I call. 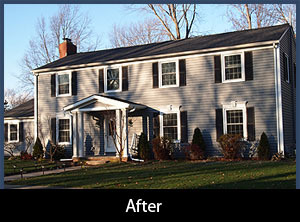 Your roofers did a great job on my mom's house." – Corlett E.
"Thank you for a great job!! Your crew was very professional. They left the property very clean." – Erik T.
"We are so happy with our new roof. I was impressed with the timeliness of your crew, and even more impressed when they came back in the rain and cold to clean the deck and the driveway. They did a fabulous job." – Sue M.
"Thanks for your kindness and quick response to issues needing to be resolved. You are both a pleasure to work with. Your roofers have all been hardworking and great teammates! So nice to see!" – Fran and Joe O. "Thanks for doing a wonderful job on the roof. It adds class to the house." – Pat K.